A white T-shirt worn and stained, a highway cloverleaf out of sand, ruins made from common hardware and found objects, these are the symbols that haunt the work of Justine Reyes, Liset Castillo, Jose Ruiz. The paths they each suggest begin deep within the psyche, their exact location unknown and perhaps, unknowable. Nourished by travel and other life experiences, the symbols evolve over time and gain in transformative power. Narrative threads emerge, becoming clues to decipher their mysteries. When fully manifest, the symbols retain their singular link to their creator while generating multiple associations. Not bound by a specific identity, they are able to function simultaneously at several places, and to collapse past, present and future. Consider a range from pop and public display signage to religious and political iconography. Instead of secondary offshoots from handed down authorities, the invented symbols of Justine Reyes, Liset Castillo, and Jose Ruiz chart an interstice where in varying degrees of self-consciousness, the private and collective feed each other. Material presence is made abstract, and the intangible assumes substance. Symbolism and realism converge. Though no less sacral, access to their everyday symbols is not restricted to the privileged and the initiated, requiring only from the neophyte an open mind, curiosity, and a lust to wander. 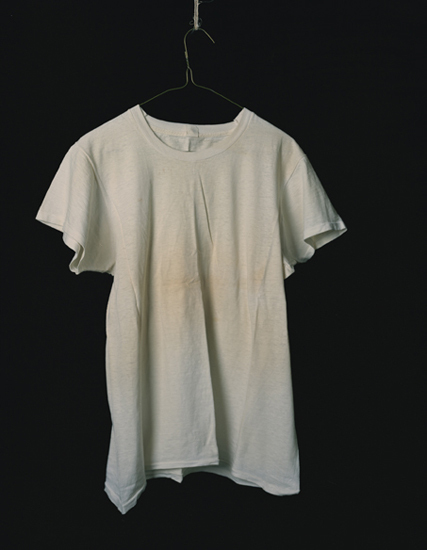 Reyes’ What Remains documents the work T-shirts of her deceased and cherished Uncle Vinny. Italian on her maternal side and Mexican on her paternal, she grew up in a pan-cultural environment, and developed a lasting sense of family at a young age. 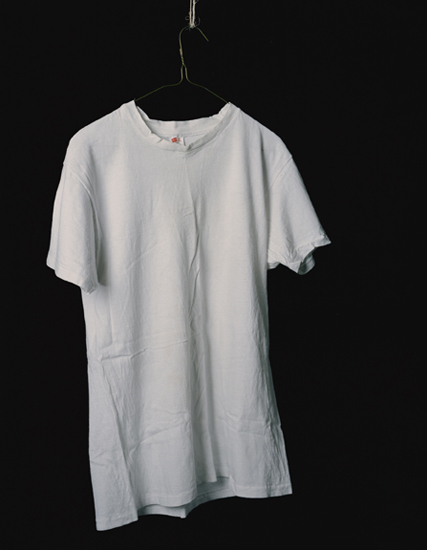 In the photographs, the T-shirts appear isolated and vulnerable against a black background, and rest unassumingly on wire hangers that dangle from the ceiling by strands of twine. Each bears a unique imprint of habit, time and wear, with silent grace. 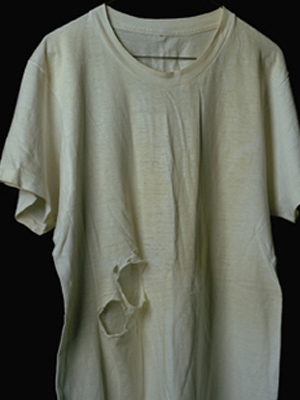 Some of the garments are nicotine-stained. Others are torn and creased. Still others have red accents from their labels. When viewed up close, their washed cotton finds material resonance in the linen-wrapped frames, whose tiny fibers enhance a sensual tactility. As much about the ache of holding on as about the relief of letting go, the elegiac portraits summarize and distill the memory of Reye’s uncle, his presence is felt through his absence. Intimate in scale, they become living mementos, eliciting a strong emotional response. With the devotional spirit of retablo, they underscore the artist’s love of objects and their talismanic force, also expressed in the personal altars by her bedside. At the same time, they are capable of transcending individual circumstance, and suggest a general narrative of loss and recovery. 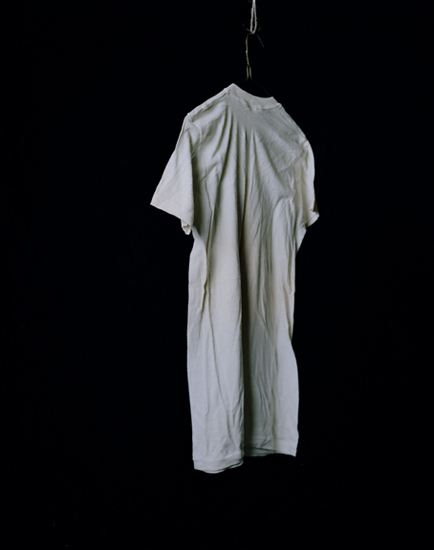 Akin to the spectral depictions of shroud of Turin and more recently, the lace christening dresses in Adam Fuss’s series of photograms, My Ghost, they evoke the fleeting nature of existence and preciousness of life in the tradition of Dutch vanitas paintings. Castillo’s Departure Point Series also tells of transcience. In these aerial landscape photographs, pristine yet desolate sand highways pit man-made structures against nature in a perpetual cycle of construction and destruction. Emblematic of an imperiled utopia, her images of transportation engage our need for order and legacy. They question the very purposefulness of human enterprise, and perhaps, the politics of her native Cuba. At the same time, they offer the promise of change and freedom of the open road. This ambivalence carries over onto the series’ title. Although her highways and cloverleaves are fragments, they indicate a starting place for a journey, a skeletal story line awaiting completion, while alluding to the experience of life an death we all share. A symbiotic equivalence binds Castillo’s materials, process and subject. She became interested in using sand on a visit to Cuba after living in Holland. An enduring metaphor for the passage of time, sand compromises countless, crushed particles that together act like water. This fluidity synchs with Holland being claimed from the sea and her becoming an immigrant without a permanent residence. These volatile conditions, along with her passion for architecture and the social impact of urban and natural forms, let to her own vision of ebb and flow. Outside her studio, the artist painstakingly builds her fragile models, shooting them from above at a moment of transition. In the oversized prints, the illusion triggers a kinesthetic reaction. Rugged landmasses and smooth highways create a palpable contrast. Meanwhile, the rush of a straight stretch, the up and down loop of an interchange, or the meander around corners fuels the unseen driver on these landscapes of the soul. In his installation, I Left My Heart in Machu Picchu, Ruiz examines the notion of discovery and conquest. Using Machu Picchu as his primary source, he starts by humoring the common practice of lumping his native Peru and site in synonymy. Voted one of the Seven Wonders of the World, it is now overrun with well-intentioned thrill and spiritual seekers. But the former winter retreat of the Inca ruler Pachacuti Yupanqui continues to elude: full knowledge of its function remains incomplete as does its mortar-less stonework, whose shapes mimic surrounding mountains and honor the deities whom many believe inhabit them. Ruiz returned to Machu Picchu in fall 2007 to conduct research in the role of tourist/anthropologist. With humor and gravity, the ensuing installation updates the cultural record in a layered procession of posters, sculptures, and photographs. The posters take on the explorer figure by conflating Hollywood’s dashing advernturer Indiana Jones with two contasting views. One features the famous archeologist Hiram Bingham III. Led to the site in 1911, he later sent to Yale University thousands of artifacts whose patrimony is now contested. The other showcases your average tourist in similar garb. At a distance, the sculptures resemble improvisations from common consumer materials and found objects in dialogue with a broad spectrum of post World War II sculptural practice, from minimalist abstraction to anything-goes assemblage. Up close, they turn out to be to-scale interpretations of key structures, such as the Temple of the Condor. Tucked into the back corner, six photographs, slightly larger than snapshots, show vacationers at the complex roaming the terraced fields and intricate architectural formations, including those that inspired the sculptures. Even as these images complete the temporal loop, they offer the final clue to the viewer who takes their place. In an “American-made” transfiguration, the ancient becomes contemporary; the ancient becomes contemporary; the ceremonial, casual; the enigmatic, accessible; the fictitious, material. From fragments of a life and an infrastructure to an entire civilization, Via Simbolica makes the case that each can be an effective foundation for a symbol and for a larger exploration of the effects of time and memory. Fully aware of their shifting nature, the artists create conceptually driven works from a global perspective, whose impact is felt first, then contemplated. Upon release, they take on an existence of their own, destined to outlive their subjects as future relics. A fusion of reality and imagination, their iconography leads to an expansive quest for knowledge, for something that might guide or illuminates us to a truth of our own making. In an age rife with irony and hubris, these symbols encourage out need to question and restore our will to believe. about the artist: Justine Reyes was born in California and now lives and works in New York. She received an MFA from the San Francisco Art Institute and has shown her photography and installation and video works in the United States and abroad. She is now an artist in residence at the College. 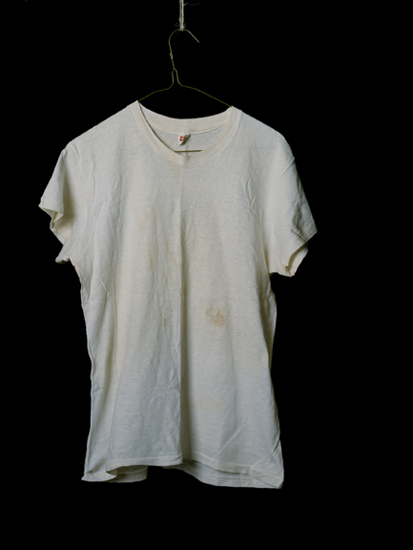 Her “What Remains” photo series documents the work T-shirts of a beloved deceased uncle. Each bears a unique imprint of habit, time and wear with silent grace: his presence is felt through his absence. about the curator: Curator Sarah Tanguy was born in Malaysia. She holds an MA in Art History from the University of North Carolina, Chapel Hill, and is curator for the ART in Embassies Program for the U.S. Department of State. She is also an independent curator and art critic based in Washington. about the gallery: St. Mary's College of Maryland is ranked one of the best liberal arts colleges in the nation by U.S. News & World Report, The Princeton Review and Kiplinger’s. With roots going back to 1840, SMCM is the state’s only public honors college, offering academic excellence.